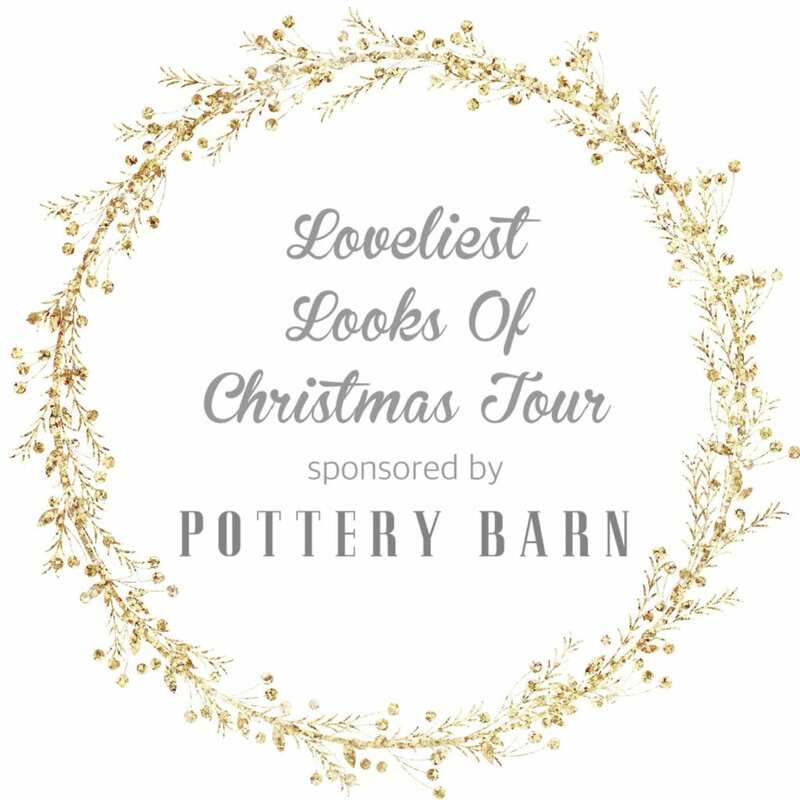 Welcome to our Loveliest Looks Of Christmas Tour, sponsored by Pottery Barn and hosted by Summer Adams & A Blissful Nest! We’re so glad you’re here to join this talented group of bloggers as we share some of our winter fashion and Christmas decor with you. I’m sharing my favorite Cozy Holiday Home Decor in my family room with all of you today. The heart of a home is technically known as the kitchen, but we spend most of our time in the family room. It’s one of my favorite spaces in the house… and while it took me forever to get the design right, I’m so happy with how it turned out. It’s actually quite easy once you have a few tips and tricks under your belt and know what to look for when ordering pieces or shopping in the stores. Even for white, neutral spaces like mine. I’ll be sharing a few pieces of what I added to my family room to cozy up the space – most of which is from Pottery Barn and you can click the links to shop directly. Adding little pops of holiday cheer in unexpected places – like a side table or under the Christmas tree can impress and surprise your guests. I try to go the extra mile, and my friends and family always love it. Even if you don’t like to change your entire holiday decor scheme every year, switching it up is fun and easy by adding small accent pieces. How cute is this little german glitter house ornament? The second I saw it.. I knew I had to have it. Placing ornaments on end tables, coffee tables, trays or down the table is an easy way to decorate without trying too hard or breaking the bank! Another decor piece I think is adorable is the little brass reindeer accent piece next to the german house. It’s the perfect accent, especially if you’re into the newer gold and brass metal look. It comes in a few sizes and looks great on my side table. Simple, yet festive. I like to keep the coffee table clean but add tons of coffee table books, flowers, and candles for warmth. I like to remove the paper covers of many coffee table books because I love to see the texture of the book itself. I’m always looking for those layers! You may be surprised.. the paper cover may be something that won’t work, but the actual book itself may be the perfect color needed to pull your room together. I then stack them for height and interest on the coffee table. On top of a stack, paper whites in an antique silver dish are surrounded by faux snow..so fun! Paper whites are one of my favorite holiday florals to work with – so easy and elegant. On top of another stack sits one of my favorite finds this year, the white mercury votive holders that come in a set of 6. The price is hard to beat and they each have a different height and design. They come in a few color options, such as gold and silver too. The metallic interior of the votives provide the perfect glow to a space. Moving on to the Christmas tree… in addition to the ornaments, I added little flameless candle ornaments on to the tree. I painted the clips gold, which gives my tree the old world look that I love, and they blend beautifully with my shiny mental ornaments. Unfortunately these little ornaments are sold out from Pottery Barn, but click here for the exact same set from a different retailer. I’m going to be doing a blog post on how I decorated my Christmas trees so make sure to check back for that sometime this week! Christmas trees always look more beautiful when anything is placed underneath. To help fill the space before all the presents arrive, I like to stack various holiday items underneath to fill the void and hide unwanted cords and wires.. This year I found incredible clear glass finials that I stuffed with copper twinkle lights and found the look to be cozy and fun! The finials come in 3 sizes and I have the medium and small. Another item that you can add for interest is a faux potted plant! The faux potted berry branch sage topiaries under the tree are so cute that I added 3. The size makes them versatile and they can be used in basically every space. Also I’m obsessing over the faux fur leopard slippers. I added a pair under the tree and now I think I need them there all the time. ;) They come in a few colors and I plan to get a few to give as gifts for friends and family. They are only $29.50. Other decor accents I added are gold & white gift boxes, glitter Santa accessories, and fluffy faux fur presents! For added interest, I draped a glitter snowflake garland across my mirror.. just another detail that I think is fun and will surprise your guests. This garland is an oldie from PB but click here for a similar garland. This winter, I’m planning on wearing simple, yet adorable outfits. My favorite? The black jumpsuit. I’ve invested in a few this year and love the way I look and feel in them. They are versatile and easy-going, making it a ‘throw on’ and run out the door kind of outfit.. the very best. We had so much fun getting our family room “holiday ready” for the first time in our new home. The entire family is loving the warmth and cozy look that the tree, lights, and decor provide. For more inspiration.. you need to check out some of my amazingly talented friends in our tour below. I am always looking to others for inspiration, just like you – and they have done an incredible job. Thank you to Pottery Barn for sponsoring this post. « Best Tech Christmas Gifts 2018 – Jeff Approved! Such a beautiful tour! I LOVE the small topiaries under the tree, great idea Kristy! That PB fur throw blanket is my absolute favorite and I need to order one of your candles my friend. Everything looks amazing and so perfect for the holidays! So many pretty details! The blush and silver are so pretty together!